The catastrophic eruption and lava flows of Mount St. Helens was so hot everything incinerated at its touch. After years of decay, what's left are amazing chimney-shaped lava holes where the trees formerly stood. The topsoil is rejuvenating and former tree stumps appear. Called the Trail of Two Forests, you'll see casts of old growth trees buried by lava flows. A quarter mile stroll on a flat boardwalk. Where once laid approximately 3 miles of underground funnel-like tubes of open space — seemingly cemented — enter through the middle of the tube where it caved in, and walk in either direction, deep into the earth. Open to the public but unlighted, join the many explorers of our Pacific Northwest mountains region on an incredible walk not seen by many. Lanterns or flashlights a must; decent shoes are needed. Mt. Saint Helens a national monument and active volcano, has a history dating back 40,000 years... She is one of 5 Washington State volcanoes. On May 18, 1980, the eruption brought this quiet mountain to the world's attention. You'll see the devastation caused by the 1980 eruption and the slow return of nature's flora. you'll see the amazing blast side of the mountain, with it's new ice glacier and 2 new lava cones. If - The weather decides not to cooperate, we will gladly switch the tour to visit the Mt. Saint Helens Lava Tube, a cave created by hot gasses from an epic event thousands of years ago. 1 full day, packed with fun and adventure with our knowledgeable, personable tour guide. Same price and though very different tours, still all about Mt St. Helens! Originally named Mt. Tahoma by the Natives, it means Place Where Water Begins. Mt. Rainier will delight you with its vast expanses of pristine old-growth evergreen forests, sub-alpine meadows, and spectacular alpine vistas. Our nation's 5th-oldest National Park, and tallest peak Mt. 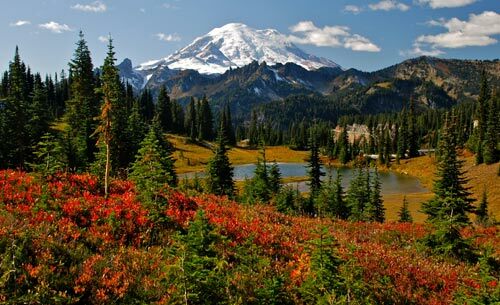 Rainier, a dormant volcano at 14,410 feet, has the greatest single-peak glacial system in the United States. Feel the peace and power on this journey to the 5,400-foot elevation called Paradise. As you make your way through easy walking paths and trails, you'll make 3 stops including: Visitors Center and beautiful Narada Falls. High above and inside the Park, you’ll have plenty of time to walk the trails on top of the world, so it will seem. A beautiful and favorite stop for many visitors and locals, you’ll stop at 2 visitors centers. Be prepared to be amazed at the views. We see deer and rabbits often, and the wild flowers are so wonderful here. It’s really the stunning views that really get you, be ready to feel the power and see the beauty of the Olympic mountains. 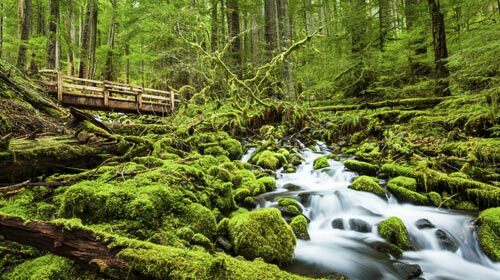 On the Olympic Peninsula, you will wander through a thick, lush forest of Big Leaf Maple, walk an interpretive trail along a beautiful stream with old growth trees, and visit a pioneer homestead. This is a mountain loop tour, starting first over Stevens Pass where we will see Bridal Veil Falls and Deception Falls, then follow the Little Wenatchee River through Tumwater Canyon to Leavenworth. We’ll take a break in Leavenworth, then continue over Blewett Pass and Snoqualmie Pass, where we will stop at Snoqualmie Falls. Very Impressive Scenery. Fun Day!